I think this is true: the music we experience in childhood is music we identify with in adulthood. If your parents listened to jazz, you probably like jazz. If your parents played rock, you listen to rock. I’m not saying there is an exact correlation, that we only like the music of our childhood, but as adults we often have an affinity for certain kinds of music because of our early experiences with it. Among the great things for me growing up in The Salvation Army was the brass band music that was part of it. My father was a tuba player who enjoyed playing brass band records in the house (particularly on Sunday mornings) and as a teenager I was lucky enough to learn a brass instrument and attend a corps (the Salvation Army term for a local church “body”) large enough to support a band. This experience has given me a lasting experience with this phenomenal, if idiosyncratic, music. From time to time I dabble in it, again. The Salvation Army adopted the British brass band concept for its instrumental music, which meant that its music was portable. In a traditional church congregation, people had to come into your church building to hear the music—that’s where the organ was. The Salvation Army brass band could bring music to you, on the streets, in “open air” meetings. Things I associate with this music include the warmth of the Salvation Army band sound, mostly due to the fact that these bands use cornets instead of trumpets. I also remember the tunefulness of most pieces. To this day, I don’t know a lot of words to many hymns because I was accompanying the singing in the band, but because I was in the band I know many good tunes (and miss them in contemporary worship). Or, as in the case of “Praise, My Soul, the King of Heaven,” I’ve gone back and learned the words. Although they are amateurs, Salvation Army bandsmen take their playing seriously and the quality of music-making can be impressive. The absolute star in our band was an older gentleman (and something of a legend around The Salvation Army) named Wilf Mountain who played the euphonium. (He can be heard here on the track titled, “Euphony.”) As a young person playing in the band, I benefited from the adults around me, like Wilf, who brought a lifetime of musicianship and maturity to the experience. When you are young and in the band, you’re not exactly helpful, but the longer you play alongside those more seasoned, the more skill and confidence you develop. The professional or semi-professional brass band couldn’t, or at least might not be willing to, brook this range of abilities. I organize the music of Salvation Army brass bands into roughly three categories: marches, hymn tunes and arrangements (as heard above), and performance music. These categories can be broken down further. For example, marches come in the standard parade variety (as in the first example, above, though they usually aren’t played while marching) and a more grandiose, “festival” style for occasions. Performance music is the most wide-ranging, so I would break it down further into four types: solo instrumental, classical crossover, novelty items, and major statements. Performance music is, obviously, intended for people to listen to, but there are many purposes for performance. One example is to entertain, delighting the listener in some way. I’m pretty sure my first exposure to Antonín Dvořák’s music was through a transcription/arrangement for brass band. For a couple of weeks, I had a piece of music in my head from my Salvation Army upbringing. I have gone back to listen to it a number of times so now it’s more firmly in my head. It’s called “Resurgam,” which I would categorize as a major statement within the realm of performance music. This music, I believe, is not meant to entertain so much as to transform and transport. The full power of this music certainly alluded me when I was younger even if I enjoyed the music so much that it has stayed with me. On the list of the most profound musical statements in Salvation Army repertoire, I imagine “Resurgam” would be high on the list. —It was written by a man named Eric Ball. The man, I was told, was something of a mystic, which gave his music an x factor that wasn’t necessarily present in every piece of Salvation Army music. Nothing spooky. But the thought was that he was perhaps onto something or Something. He was at one time a Salvation Army officer, but resigned because of his spirituality. 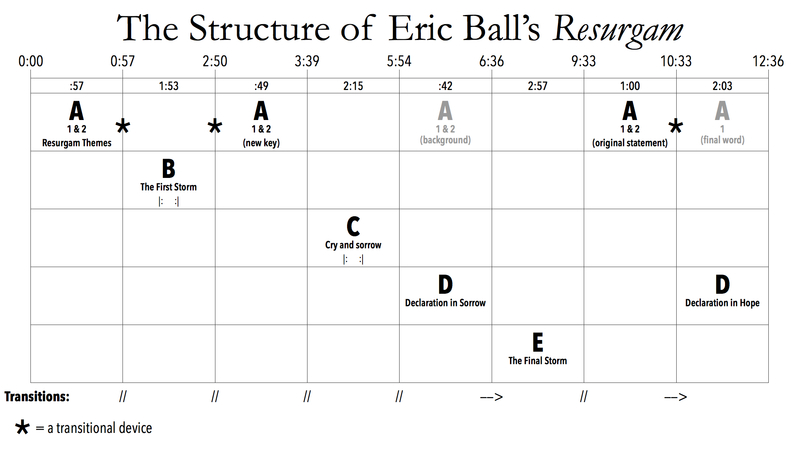 (The portion of Chapter 3 of a biography of Eric Ball that is available here provides some explanation about this separation.) A tribute album for Ball and his music includes a short clip of him talking, which is fascinating. I think these words were printed at the front of the score. In contrast, “Resurgam” is idea music. You don’t associate words, necessarily, with the sounds you hear (with one possible exception), but this music is full of meaning. I wouldn’t have had the vocabulary when I was introduced to this music as an adolescent, but today I know that in the history of Western classical music, composers followed a couple of paths when they created musical works. Programmatic music isn’t always so specific to the point where a certain sound is intended to convey a certain image. Sometimes it’s more about communicating ideas. That is, I believe, the case with “Resurgam” (at least until I do further research and learn otherwise). My hunch is that it most certainly is programmatic music because it is conveying a truth about ultimate things (i.e. resurrection) even though it isn’t painting a specific picture. The sounds are meant to stimulate thought and our imaginations are free to read into many of these sounds we hear. I would add that there is a deeply affecting quality to this music, which means that this aural phenomenon is working on the listener on both an intellectual and emotional level. 1. This is not a short piece. I’ve seen versions that take as little as 11:30 and as long as 13:15 and everything in between. It’s not a Mahler-like commitment to listen to this music, but for anyone used to the length of radio edits of popular music, this is a stretch. 2. This is dynamic music, which asks to be heard on its terms. It is full of extremes in terms of tempo, dynamics, and affect. This is not great music to play in the background while doing other things. (For one, to have the volume loud enough to hear the quiet passages while you’re bopping around the house, means the windows are going to be rattling when the music hits its peak.) In fact, once you surrender yourself to this music it may not be possible to do other things very well (or you won’t be listening very well). 3. “Resurgam” is tonal music, but it’s often more motivic than melodic. In the way that Beethoven took Da-Da-Da-DAAAAA as a building block and created a melodic line, Ball has a number of motifs that appear in this work. As you can’t get away from that initial figure from Beethoven, so that what you perhaps associate primarily with that work is that opening Da-Da-Da-DAAAAA, there is an opening figure in “Resurgam” that will return again and again. There are five basic ideas that are presented to us. Some are repeated, others come and then are gone. The timings are based on a recording by the International Staff Band of the Salvation Army. The sections sometimes have obvious breaks (noted on the line “Transitions” with “//”.) Sometimes one section moves right into the next (noted with “——>”). While both lyrics fit, I prefer associating the words “Awake thou that sleepest” with this opening call because those words seem more like an appropriate wake-up call. (Mindful that it’s a gentle shake with a cheery “Time to get up” rather than a harsh “Wake up!”) The other words, while an appropriate reflection for the work, seem too didactic for that opening melody. The key to this opening call is that first interval—a Major 6th. It’s the opening interval from “My Bonnie Lies Over the Ocean,” but it’s also the same interval used in the chorus of a Salvation Army song, “I Serve A Risen Savior,” which certainly seems appropriate. There is a triumphant quality to that interval although its use in this A section shows a lot of restraint. The response to this call is a contrast. Where the A1 theme has that soaring interval, the A2 response also has an opening leap, but it is a minor 6th interval (not triumphant) and the rest of the opening call has a downward feel about it. There are a number of juxtapositions in this call and response. The starkness of the opening call (A1) is followed by this luscious harmonious response, full of suspensions and pathos. If A1 is a call, perhaps A2 is a cry or lament. There is more hand-wringing in this second part than in the opening call. This is restless, relentless music. It’s pounding and pulsing. The syncopated rhythms throw us off. And then we have that cry that leads to a blow of some sort. What peace we might have had in the A section has been replaced by a storm. There is a note of terror or perhaps rage. After a repeated section, eventually the storm blows itself out (though only temporarily). A word about transitions (noted with an “*” on the structural chart). The end of Section A included a little transitional figure that sounds like this. This little figure brings the A section to a close. As the storm of this B section winds down, that little figure from the close of section A returns to close out Section B. In both cases of the transitional device so far, it brought the music to a stop. After section A it allows us to experience something totally new in terms of tempo and emotion. This device at the end of Section B also brings us to a stop. Where do we go from here? In the case of “Resurgam,” we move forward by going backward. There are many great moments in “Resurgam.” One of them comes after the storm of the B section when the opening call is reprised with the middle brass taking the lead in a new key. This is followed by that soulful response of the second Resurgam theme (A2). The last time the A section ended, the piece took off with a kind of fury. It seems like we may be going there again because we are hit by one of the most agonizing moments in the piece. If this is a piece about life after death, it’s a reminder that death often means waves of grief for those who are left behind. And so after the reprise of the A section (the Resurgam Themes) we head into darkness. There’s no escaping sorrow so the music takes us into the depths with a gorgeous cornet solo. The tune just played by the cornet is picked up by the lower brass while the cornets perform a kind of obligato over the top. The music swells, but with grief, not triumph. I love how in the background of this euphonium solo we hear the return of the A1 call, “Awake, thou that sleepest.” The point here is, I believe, that death is not the final word. This is another great moment in this piece. I think it’s important that it’s a solo voice. The individual nature of death meant that Ball needed to create a very personal work and this is a personal moment, almost operatic in nature. The euphonium is the instrument that is perhaps the closest to the human voice in timbre. Up to now each section has had a full stop, with at least a breath to separate sections. As the euphonium solo comes to a close, the A2 theme returns (we’ve already heard the A1 theme in the background) but it is not allowed to finish. There is an interruption and a second storm arrives on the scene. There is no resolve to be found at least in that moment. The second storm is longer and more violent than the first. Is there a note of desperation? The second storm features relentless rhythms, more syncopation, furious counterpoint, menacing lower brass. The highlight of this section for me is the lower brass, which at one point aren’t given notes to play so much as a role to perform. They are positively sneering at the person of faith. This is dark stuff. But as the storm ended quietly once, so it ends quietly again, here. The A section returns. I don’t have a score in front of me, but it sounds as though it is a direct copy of the opening A section. There is one crucial difference this time with that little transitional device (“*”) we heard early on. The first two times we heard it, it was a bit of a conversation stopper. This third time, now, it leads us into the conclusion of the piece, the repeat of the D section. It’s a really subtle thing, but I love what Ball does here with the connective tissue of this piece. The euphonium solo you hear at the end of that last examples marks a reprise of the D section, although it is transformed for the conclusion of the piece. There are a couple of important intervals in that euphonium solo (which will be taken, triumphantly, by the cornets momentarily). The first is that Major 6th from the A1 theme. The second interval is a perfect 5th (my immediate association for that interval is the theme music from Star Wars). As these two intervals are placed together, the rise of the two gives us a marvelously aspiring final theme, which has a fanfare quality about it. This final section, as performed by a band, shouldn’t be excerpted and so I won’t. Since you can only hear it once for the first time, it should be heard in the context of hearing the entire piece. It’s wonderful. Brass band music is a bit of a niche, to say the least, but this build that Ball includes here in the last section, where the declaration that the euphonium made in the first D section is now transformed into this spectacular, life-affirming or, better, life-promising statement of “I will rise again,” is phenomenal. I put this moment up against some of the great moments in, say Wagner, Bruckner, or Mahler. This is something to be experienced. A word about the ending. The climax is not the end. In fact, a pulling back (both the melody has begun descending and the volume has started decreasing) keeps the climax from becoming the destination of the piece. The A theme returns at the close of the piece. But it’s simply the A1 call. We no longer need the slowly descending, hand-wringing response of the second Resurgam theme. The opening call gets the last word. A great composer orders sound over time in such a way that we are no longer aware of the passing of time. Ball is in this camp. But he goes one step further: our experience in time after listening to this music is altered. We are not sent from this music with a temporary toe-tapping euphoria, but a quiet confidence in the truth that the souls of the righteous are, indeed, in the hands of God. All of the above examples from “Resurgam” are from a recording by the International Staff Band of The Salvation Army, from their album, Partita. I have a CD, but I see that the music can be heard here, where there is a link provided to purchase a CD. This is a wonderful performance, worth the investment of time. There is perhaps more of an “edge of your seat” excitement and rawness to the Enfield recording, while the International Staff Band may have a better overall blend, but my ears have these as relatively comparable recordings. One thing to appreciate in both recordings is the quality of the soloists. Two bands unaffiliated with The Salvation Army offer extraordinary interpretations of this piece. The Black Dyke Mills band has a technical facility that gives them the ability to interpret this music differently. It’s subtle, but they play with rhythms and feels. They interpret a line of music rather than follow a metronomic pulse to play the music. Their blend and tonal center is unreal in its purity. They often play the music at extremes—both faster and slower. Their performance of “Resurgam” is available by download here, although I’ve seen used CDs of Black Dyke Gold: Volume 1 available at Amazon. The Grimethorpe Colliery RJB Band is also phenomenal, but they seem to have more of an affinity for vibrato and of a quicker sort than I hear with other bands. Their style is an interesting counterpoint to Black Dyke. (It’s not that you don’t hear vibrato in Black Dyke, but I think it’s offered more sparingly.) I suspect it comes down to preference. Their recording can be downloaded here. The performances I’ve sampled on YouTube are interesting. They can be heard (and seen) here, here, and here. This one demonstrates there is a limit to how much resonance you might want in your performing location before it becomes a distraction. So many postings of performances of this work on YouTube suggest there is a fair amount of participation in brass bands both in and out of England and in and out of The Salvation Army. These performances serve as a testament to the spirit of amateurism, defined as doing things for pleasure, not profit, and evidence to the fact that many of us in the world are able to pursue varied interests because our societies provide us with the time, space, resources, and stability needed to do so. The first example above is the opening of “Montreal Citadel” by Egon Virtuosi Brass from its recording, Classic Marches of The Salvation Army. I own a CD but it may be out print. An historical record may be found here. The excerpt of “Praise, My Soul the King of Heaven” is by, I think, the Bristol Easton Band available on iTunes here or at Amazon here. The Canadian Staff Band’s The Gospel Train was among the most played albums in our home. In addition to “Melodies of Dvořák,” excerpted above, cornet player Deryck Diffey’s “Golden Slippers” and the march, “Just Like John” seem like iconic moments in the history of Salvation Army banding. Under the direction of Norman Bearcroft and with Diffey’s tonal leadership, the band had a bright and assertive tone. The cornet solo, “In the Love of Jesus,” is by the Frelsesarmeens Territoriale Honorkester (which I believe translates as the Norwegian Territorial Band of The Salvation Army) and available from iTunes. This arrangement is just beautiful, falling under the “less is more” school of composing. I especially enjoy the lovely suspensions and simple counterpoint between the melody and countermelody. The performance of “Die Moldau” by the Chicago Symphony Orchestra, conducted by Daniel Barenboim, comes from this CD. The performance of “Ein Alpensinfonie” by the Bavarian Radio Symphony Orchestra, conducted by Sir Georg Solti, comes from this CD. I haven’t found much in a cursory search for writings about “Resurgam.” Some notes by Robert Getz, which I referenced once above, are helpful.